The Philadelphia region can be a great place to hike with your dog. Within an hour’s drive you can hike on sand trails, climb hills that leave you panting, walk on some of the most historic grounds in America, explore the estates of America’s wealthiest families or circle lakes for 7 miles and never lose sight of the water. 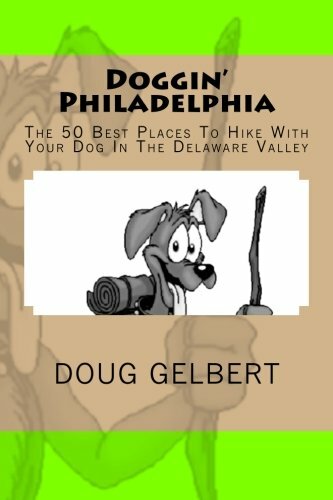 DOGGIN' PHILADELPHIA explores the region's top trails with your best friend in mind. 50 parks are reviewed in Pennsylvania, New Jersey and Delaware - all within 50 miles of Philadelphia's City Hall. Stretching for over three miles on the Schuylkill your dog can swim in the river or in the canal at many spots in this relaxed park. As the Red Dot Trail sweeps to the top of the High Rocks it is easy to feel as if you have been parachuted into the heart of the Appalachian Mountains. The Swarthmore College grounds have integrated plant collections with its buildings since 1864. Not only are water bowls chained to drinking fountains for your dog but your best trail companion can go off-leash in the adjoining 200-acre Crum Woods. A wide and well-marked path leads to the rocky summit and open westerly views of the countryside. Below the ferry pier is a sandy beach with enough wave action to trick your dog he’s chasing that stick into the Atlantic Ocean. A jewel among the region’s small parks, McKaig features three wide and well-maintained trails that work from stream valley to hilltop. There are dog-walking opportunities on both sides of the Delaware River; the more historic explorations can be found on the Pennsylvania side, the more naturalistic trails in New Jersey. The rolling countryside of the western suburbs is never in better evidence than along the five-mile Multi-Use Trail as it snakes past reconstructed huts and parade grounds. The loops around the impoundments create easy trotting for your dog. If she is patient you can stop at one of the observation blinds and identify one of the 288 species of birds recorded here.